Photomultiplier: Produced from the 48th 3D ‘example’ file. A series of rays start from a line on the photocathode. When a ray hits a dynode its energy is reduced to that of a secondary electron and its current is multiplied by a factor of 3 (as chosen by the User). The initial energies and directions of the secondaries are also chosen by the User and can be randomised. Quadrupole mass filter: From the 5th 3D ‘example’ file. Perspective view. The hyperbolic electrodes are generated from the user’s own equations. 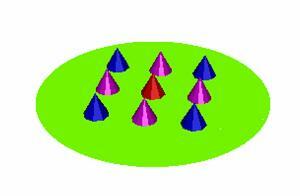 Many other non-standard shapes can be generated simply by entering your own equations. 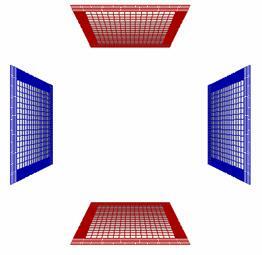 Note that in the Boundary Element Method it is not necessary to enclose the system. Simple deflector system: From the 27th 3D ‘example’ file.. Here the x and y deflector plates are flat rectangles. Note that the density of segments is highest at the edges, where the charge density is highest. 12 other types of more sophisticated deflector systems are included as examples in the CPO package. Pierce Gun: From the 12th 2D ‘example’ file. 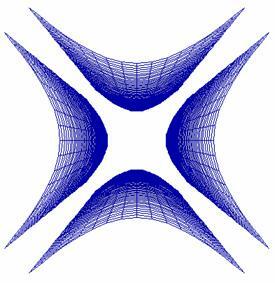 The ray tracing is automatically iterated several times until the results converge. A damping factor is provided which is controlled by the User. Some potential contours are also shown. Note that the combined effects of the surface charges on the electrodes and the space charges in the beam give contours that are perpendicular to the beam, as required for the Pierce gun. The ‘test’ and ‘example’ files deal with several other types of cathode systems, includingthermionic, Schottky and field emission cathodes. Ideal CMA (cylindrical mirror analyzer): From the 16th 3D ‘benchmark test’ file. 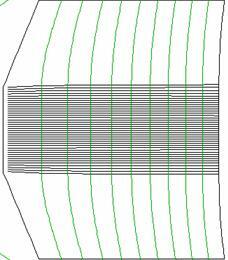 Here the 5 rays simulate a beam of full angle 10º and they are allowed to pass through the inner cylinder. The second‑order focusing action of the CMA gives a small spot at the focal point. Several other ideal and practical energy analyzers are included in the ‘test’ and ‘example’ files. A 3-cylinder einzel lens: From the 36th 2D ‘example’ file. The vertical scale has been expanded in this picture and some potential contours are shown. Examples of several other lenses are included in the CPO package. The programs can automatically vary one or more lens voltages to produce the smallest spot at some defined position (or even to produce a series of spots at different positions, for example for different energies). 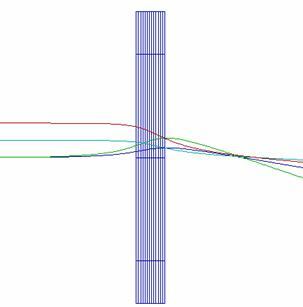 The program also gives accurate third‑order lens parameters derived from paraxial integrations. 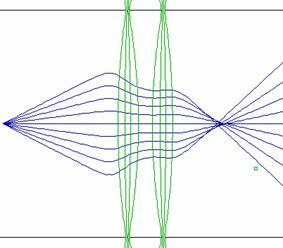 Time-varying fields: From the 8th 2D ‘benchmark test’ file. 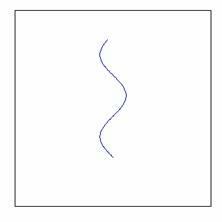 Here there is sinusoidal motion in a sinusoidal field. There are also options for ‘top‑hat’ and ‘saw‑tooth’ time dependencies. 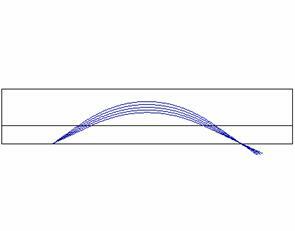 Up to three different time dependencies can be applied simultaneously (for example a sine wave plus two harmonics). Or the User can define a time dependence via an external program. Examples of these programs are included, together with detailed instructions on how to link them to the main program. X-ray tube: Produced from the 43rd 2D ‘example’ file. A simple tube with a flat thermionic cathode and an anode at 100kV. This view is expanded in the transverse direction. The iterative ‘automatic focusing’ option is used to find the optimum grid voltage. 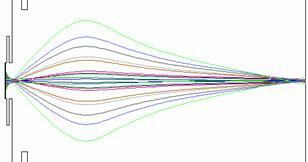 In each iteration step the space‑charge spreading is automatically established by a separate iterative procedure. 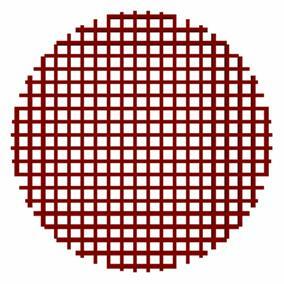 A grid of 289 holes: Produced from the 19th 3D ‘shape‘ file. A magetic lens: From the 46th 3D ‘example’ file. The CPO3D programs can be used to synthesize magnetic fields by superimposing fields from a menu of several different types (for example the fields produced by solenoids, hoops, straight or circular lengths of current, dipoles, etc). Or the User can generate fields externally on a grid of points and read them in as arrays of pre‑calculated values. The User can also define a field via an external program which can be easily linked to the main program. An array of conical nano-tubes used as field emission sources :Produced from the 53rd 3D ‘example’ file. Several other examples deal with carbon nano‑tubes, for example to find the enhancement factors of single tubes or arrays of tubes. The Surface Charge Method is ideal for dealing with very small structures in the presence of electrodes that are much larger.